Happy Music Monday. Since I didn’t love the soundtrack, here’s my stab at a Jazz Age ditty to listen to while you read my non-review review. 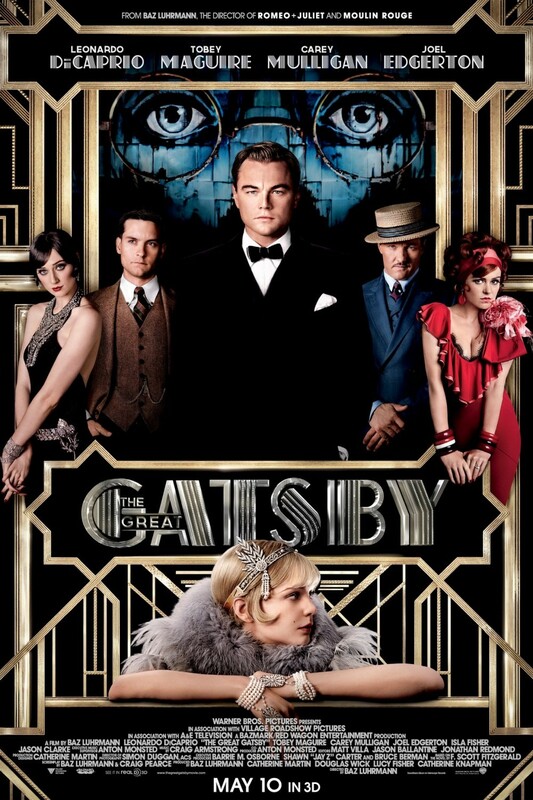 Okay, here is my take on the Great Gatsby. I was beyond excited about this movie, but after seeing the first trailer, my heart tanked, and for the next 9 months, I put on an excited act when really, I was already heart-brokenly disappointed. I loved the book so much…it is visual enough, so why would we need all the flashy extravagance this director is known for? Again, ugh. (Obviously, all of this is IMO, so no hate mail, loves.) So yeah, I made plans with my girls to see it opening night, but not thrilled in the least. I love looking at Leo, so worst case scenario, I get to stare at him for 2.5 hours. Not too tragic. Long story short–because I’m already bored with this non-review–I loved it. Almost like the book, it had me hook from the first page. Tobey was fine, a bit too tiny and pale for my personal vision of Nick Carroway, but I grew used to him quickly. Obviously, I was waiting for Leo. Not since The Third Man, had I looked so forward to a character making an appearance. And when Gatsby finally hit the screen, I was stunned. The over-the-top-visual scenes were fewer than expected and didn’t bother me as much as they could have. I know, I know, the Jazz Age was rather over-the-top, but you know what I mean. I didn’t care for the soundtrack either, and hoped there would be some updated Gershwin in there. But again, what did I expect knowing the director? Visually, it was stunning. The colors and costumes and hair dos were wonderful. The special effects were lost on me, so I won’t go into how cool the (cartoon) house looked. I’d heard a few reviews saying the two leads had no chemistry. I must disagree. I think I would sell my own sweet granny to be pressed against that oak tree with Leo. So yeah, the acting was stellar. When Gatsby was sinking to the bottom of the pool, lifeless, my girl friend and I turned to each other. She muttered, “Titanic,” and I muttered, “Jack, I’ll never let go.” Also at the end, we see another flash of Gatsby, all pressed suit and gorgeous, also a bit too Titanic-y, like when we see Jack at the top of the stairs, all non-dead. So you didn't care for the soundtrack either? My expectations were too high obviously but not even one power ballad?! Pathetic. Unfortunately Leo does not a thing for me so I'll look forward to the costumes and sparkly bits.